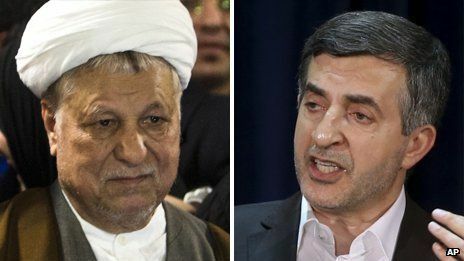 The ex Iranian president Akbar Hashemi Rafsanjani has been excluded by the Guardian Council, and barred from standing as candidates in next month's presidential election. Along with Mr Rafsanjani, Esfandiar Rahim Mashaei, a close ally of outgoing President Mahmoud Ahmadinejad, has also been excluded by the Guardian Council, state TV reported. The Guardian Council is loyal to Supreme Leader Ayatollah Ali Khamenei. Only eight of the 686 people who registered as potential candidates were reportedly cleared to stand. The eight candidates approved by the 12-member body of theologians and jurists are all considered hardliner conservatives with close links to Iran's ruling clerics.